Ireland-based artist Kevin McGloughlin has recently published Epoch, a stunning stop motion animation made entirely of Google Earth photos. It took him months to create it, and it will draw you in and make you feel as if you were in another dimension. Google has unveiled a 3-decade timelapse of Earth. It shows the images shot from space, featuring different corners of our planet and the changes they underwent over the course of thirty years. Timelapse videos are awesome, and we love them for many reasons. To me, it’s especially interesting when they’re made from screenshots, because it’s still not that common. But this one is different. It’s more than just interesting, and it’s not about the technique, technology and time it took to make it. It’s striking and eye opening. It left me with a really strong impression. Google Earth is an incredible program with many practical applications. For instance, I use it frequently for creating custom files for my handheld GPS and for mapping upcoming outdoor excursions. One of the most powerful features of Google Earth is its stunning satellite imagery which covers the four corners of the globe. This means that, for those too lazy/broke to travel the globe in real life, you can take in the splendors of the earth right from your desktop. 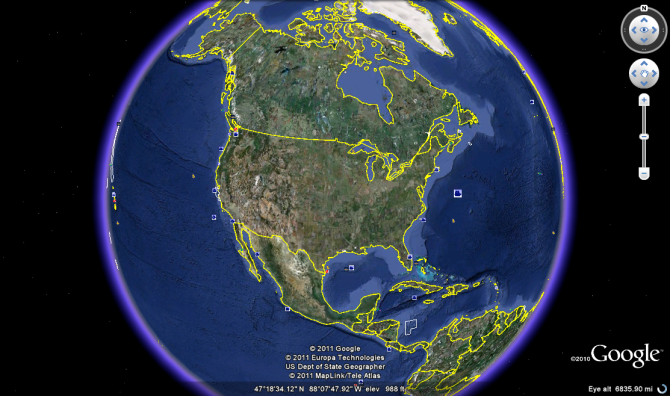 And, since Google Earth Pro went free earlier this year, you can “capture” it all in stunning HD. Earth View is boasts having “a collection of the most beautiful and striking landscapes found in Google Earth.” These images comprise varied settings from deserts to oceans, from prairies to mountains…and pretty much everything in between. All of the hard work of location scouting has been done for you, the photos have been captured, and all you have to do is simply revel in a whole lot of awesome.